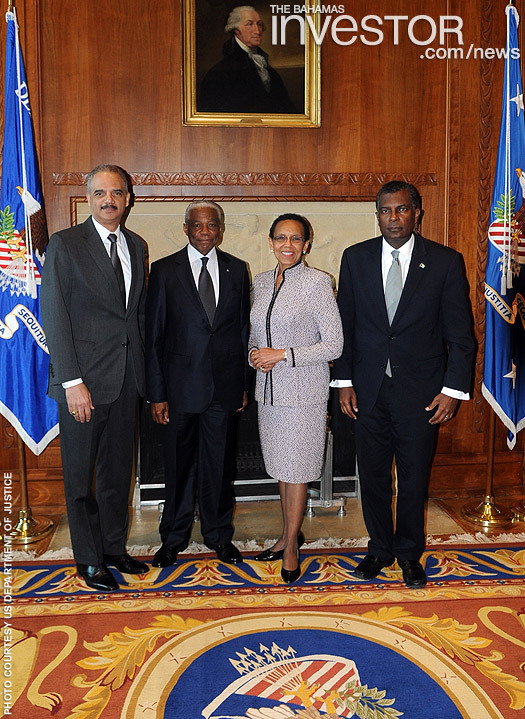 A team of senior government Ministers travelled to Washington DC March 22 for high level talks with US Attorney General Eric Holder. The delegation included Minister of National Security Bernard Nottage; Foreign Affairs and Immigration Minister Fred Mitchell and Attorney General and Minister of Legal Affairs Allyson Maynard-Gibson. The discussions focused on national security issues. While in Washington DC the team also met with Ambassador Luis CdeBaca who heads the Department of State’s Office that monitors and combats trafficking in persons globally. These meetings follow on the heels of two days of bilateral talks between the two countries in Nassau in December 2012, culminating in the signing of an Amended Letter of Agreement (ALOG) and support of $2 million through the Caribbean Basin Security Initiative (CBSI). The Washington DC meetings with Eric Holder and Ambassador CdeBaca provided an opportunity for both countries to review the progress made to date and to continue to develop the initiatives explored during the December 2012 meetings. Documentary filmmaker Brittney Armbrister says she wants to focus on Bahamian identity and culture through her work. Watch an interview with Armbrister here.